I am not a legging person! I have never been a legging person! And I probably never will be a legging person! No offense to the people that do like leggings but they are just not for me….So when I got pregnant I had a little problem. 1) I wanted to be comfortable but didn’t want to have to wear leggings or Lulu’s for my entire pregnancy and 2) I didn’t want the jeans I bought to look like maternity jeans. 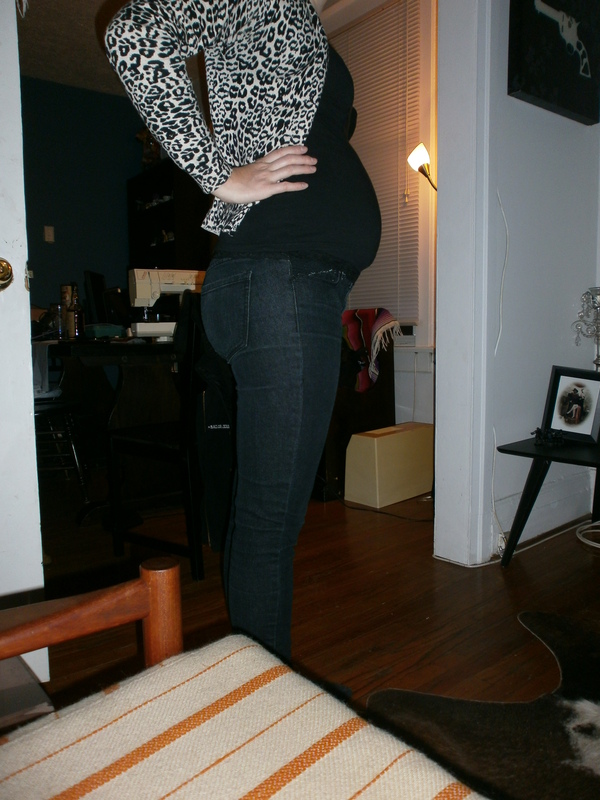 So one day my husband brought my home a lovely pair of Paige Maternity Jeans and they were faaaaaaaannnnnnnnnnnnntastic!! I love them! But again I cant wear just one pair of jeans for my entire pregnancy and I also don’t want to spend $180 or more on jeans, so I inspected them and figured I would make some of my own. 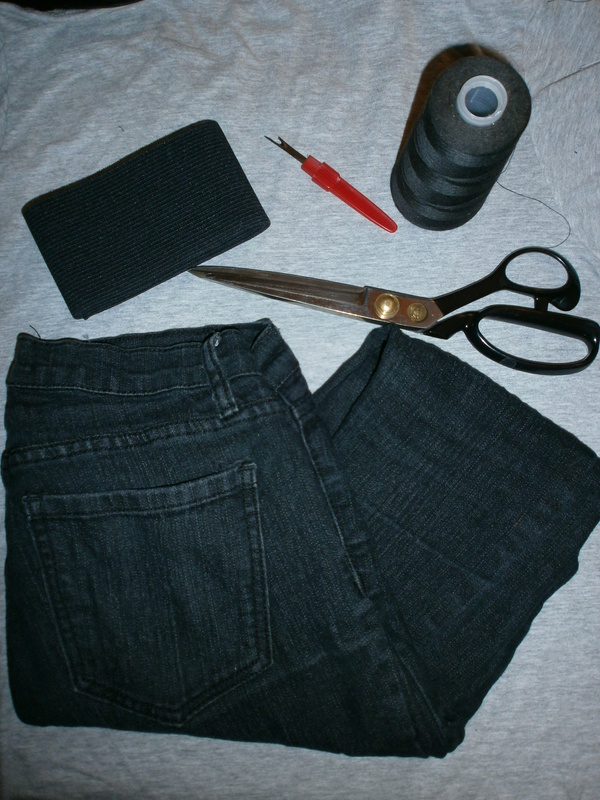 For this project you will need a pair of low rise jeans, stitch ripper, fabric scissors, matching thread, and either high stretch fabric or elastic (40mm or wider) and of course a sewing machine. 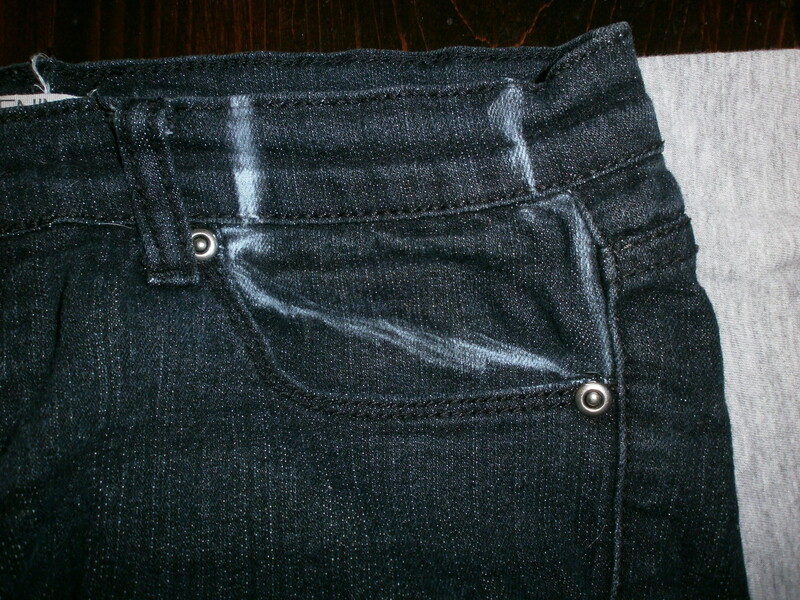 When I am doing my jeans I usually take chalk and draw where I am going to cut. I cut from the top inside corner to the bottom outside corner. 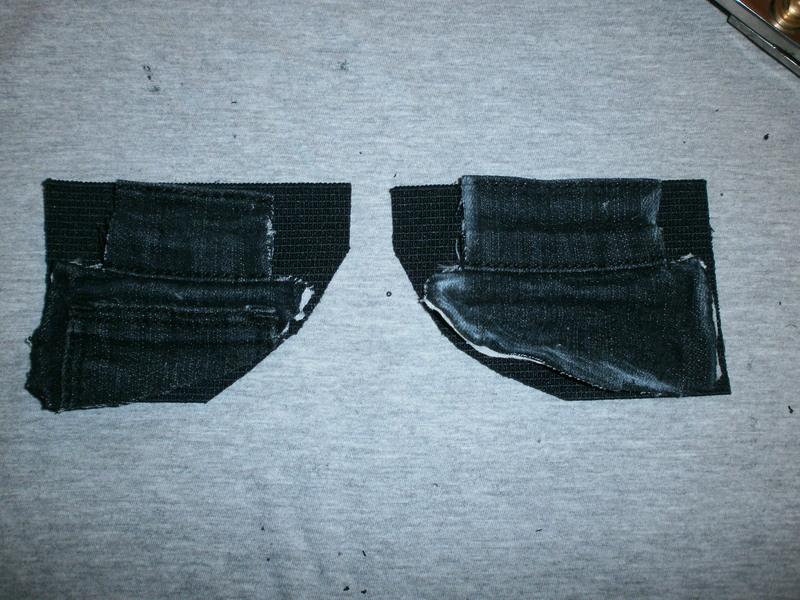 When I cutting the waistband I come in a half an inch. 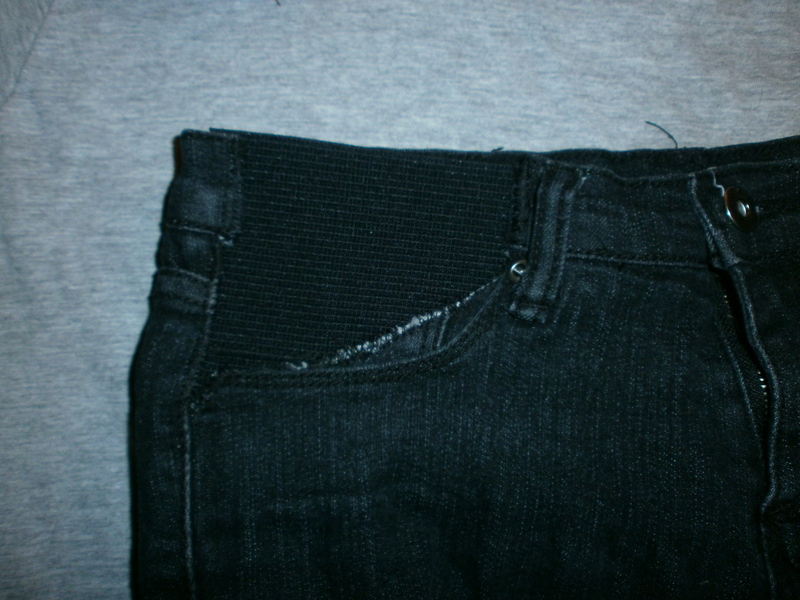 The reason that I do this is so I can stitch rip open the seams on the waistband and fold in the waistband to create a cleaner look at the waist. 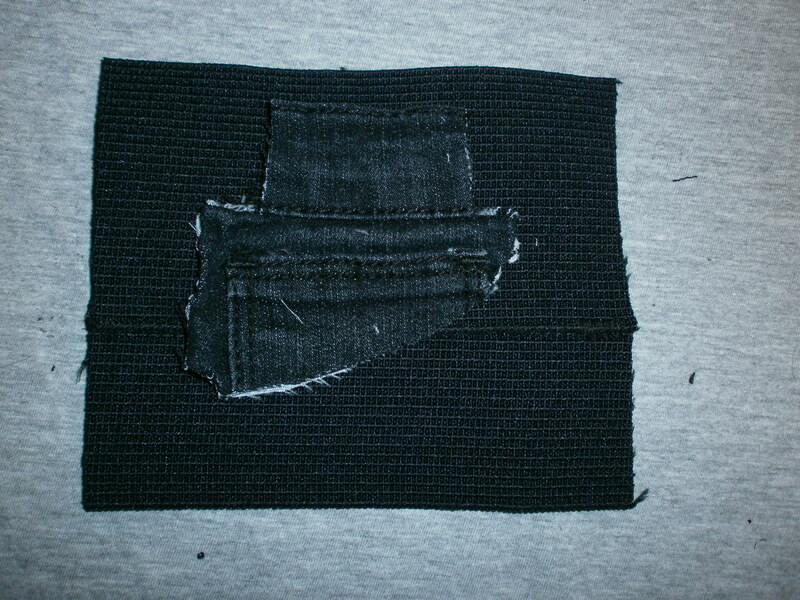 Take your pocket cut out and place it on your elastic. (Note: I used 60mm Cansew elastic and I stitched 2 peices together to make it wider to fit in my pocket) Then cut around the pocket adding a half an inch on all sides (except along the top) to provide a little seam allowance. Now you can enjoy your jeans a little more comfortably and they can expand along with your growing belly. 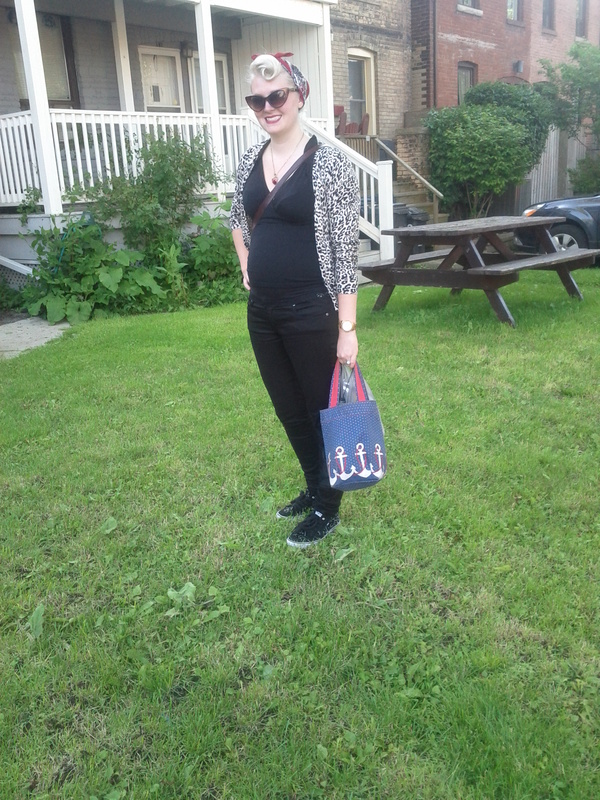 Here is my outfit today and I am wearing a pair of the maternity jeans…..Notice? You cant even tell 🙂 Today I am wearing Paige Maternity Jeans, Vans leopard print shoes, H&M cardigan, and a Rock Steady clothing shirt. Hope you enjoyed the tutorial today and please note you don’t have to be pregnant to try this 🙂 You may just have a pair of jeans that are a little too tight. This helps provide a little comfort. Posted in DIY, Fashion and tagged A Second Life, ascndlife, baby belly, baby bump, DIY, DIY maternity, DIY maternity clothing, DIY Maternity Jeans, elastic, H&M cardigan, home sewing, leopard print, leopard print cardigan, Maternity fashion, Maternity style, Paige Denim, Paige Maternity Jeans, pregnancy fashion, pregnancy style, Rock Steady, Rock Steady Clothing, rock steady sparrow top, rockabilly maternity style, rockabilly momma, Sewing, stitch ripper, Vans leopard print shoes, Vans shoes. Bookmark the permalink. On Saturday I was quite frustrated with my closet so I decided to whip something up on my own. 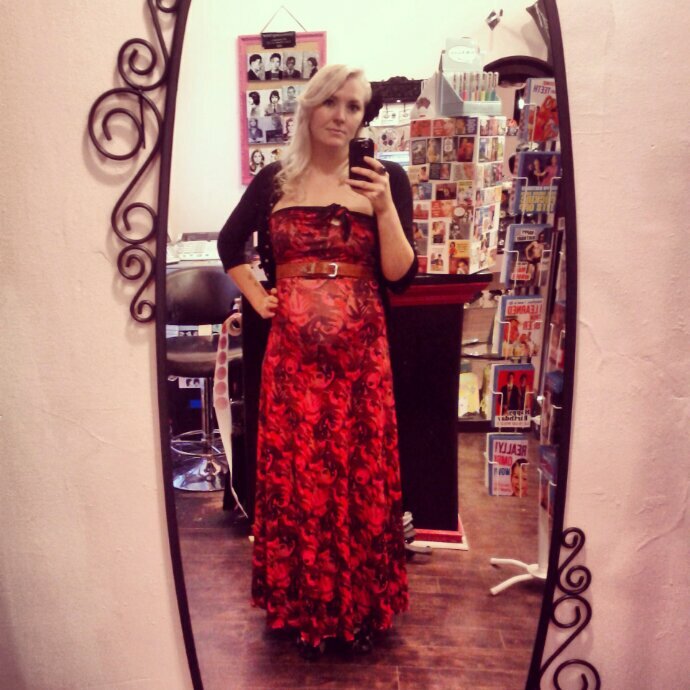 I chose to make a maxi dress with some fabric I purchased a while back. 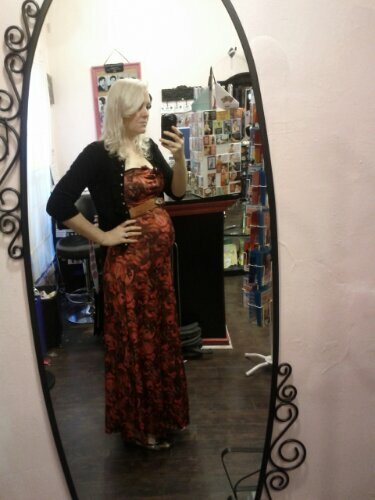 I picked out one of my favorite maxi dresses and I also chose a top that I liked. I combined the styles and came up with my own maxi dress. I am actually pretty happy with the final result. I took the tie detail from the top that I liked and I added a little extra detail by using a contrast color so the tie is more noticeable. 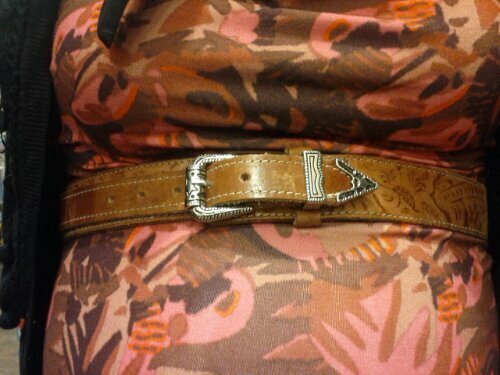 I paired the dress with a vintage cardigan and a vintage tooled leather belt. Posted in DIY, Fashion, Vintage and tagged A Second Life, ascndlife, baby belly, baby bump, DIY, DIY clothing, DIY maternity, DIY maternity clothing, Floral fabric, Floral maxi, Maternity fashion, Maternity style, maxi dress, tooled leather belt, Vintage belt, vintage cardigan, vintage maternity style, vintage tooled leather belt. Bookmark the permalink. For those of you that have been following my blog, you know that I have been planning my wedding. What most of you dont know is that I have been planning most of it myself. Being a bride on a budget I decided to save a little money by doing the invitations myself. I must say that DIY sounds alot easier than it actually is and I now see why invitations cost what they do. Heres a little break down of how our wedding invitations went. Step 1 Designed and printed. Step 2 done. Wrapped, stacked, packaged and ready to go. My wax sealing process was half done and surrounded by red envelopes. There you have it…. Signed Sealed and officially delivered! I hope our guests love them as much as I loved making them. Posted in DIY, Fashion, Vintage and tagged A Second Life, ascndlife, budget invitation, budget wedding invitation, DIY, DIY invitations, DIY wedding invitation, Michael's wax seal, Michael's wax stamp, Photoshop, Photoshop invitations, Photoshop wedding invitation, red envelope, red ribbon, red satin ribbon, Rockabilly invitation, Rockabilly wedding invitation, roses, sparrow border, vintage inspired invitation, wax envelope seal, wax seal, wax Stamper, wedding invitation, western font. Bookmark the permalink.